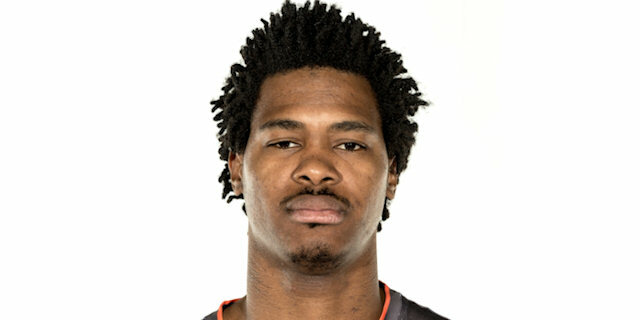 EA7 Emporio Armani Milan improved to 2-0 in Turkish Airlines Euroleague Group C after holding off a feisty Cedevita Zagreb 71-83 on Friday at the Drazen Petrovic Center in the Croatian capital. 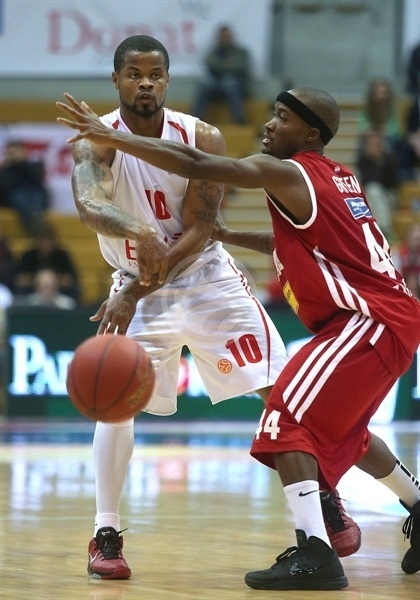 The visiting guard were too much for Zagreb as Omar Cook and Keith Langford combined for 32 points and 10 assists. Cook made 5-of-7 three-pointers and the team shot 11 for 22 from downtown, which helped compensate for 16 turnovers. 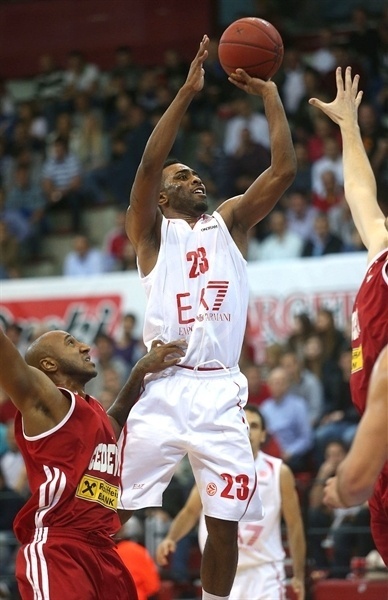 Cedevita kept it close and entered the fourth quarter down 3, but Langford heated up and scored 9 of his 17 points in the last eight minutes to put the game away. Cook added 15 points and 6 assists, while Antonis Fotsis tallied 13 points and 8 rebounds and Ioannis Bourousis contributed 11 and 8. 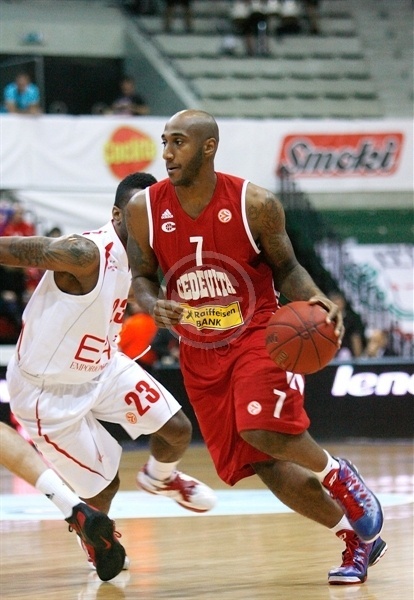 Mickeal Gelabale led Cedevita with 20 points and 8 rebounds and Bracey Wright scored 14 in defeat. Both teams missed their first shots before Fotsis got the visitors going with a three from the corner and Marques Green nailed a long jumper for the hosts. Outside shooting remained Armani’s best weapon as Cook hit a three and Langford a long two before Bourousis passed from the top of the key to a wide-open Fotsis under the rim for a 4-10 lead. Cedevita turned to Luksa Andric, who scored twice to trim the deficit to 8-12 midway through the opening quarter. Wright soon followed with his first basket. Gelabale fired in a jumper with his foot on the three-point line to even things at 14-14. Bourousis restored Milan’s advantage from the line and Rok Stipcevic, fresh off the bench, added to the visitors’ tally. Langford pulled up from the middle of the paint to put Armani up 5, but Gelabale free throws made it 16-19 at the end of the quarter. Alessandro Gentile got on the scoreboard for Armani with a three-point play, but the lead was soon cut to 2 after Miro Bilan scored inside and Vlado Ilievski from the perimeter. Gelabale went down low and tied the score at 22-22 with a baby hook before Wright’s mid-range jumper gave the hosts their first lead. Gelabale then drained a three to cap an 11-0 run. Cook heated up quickly for Armani with back-to-back threes and an assists to Gentile as Milan soared ahead 27-30 midway through the second quarter. 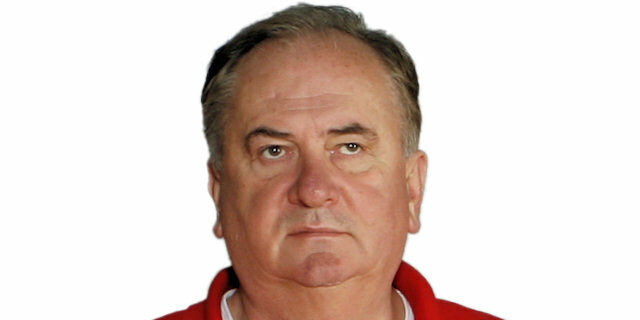 Cedevita coach Bozidar Maljkovic called a timeout after which Luka Babic fired in a three. Langford twice put Armani back on top only to see Wright drain a three to make it 35-34. A pair of great passes resulted in an Andric layup, but Gianluca Basile and Bourousis combined for 4 free throws and a 1-point Milan lead. 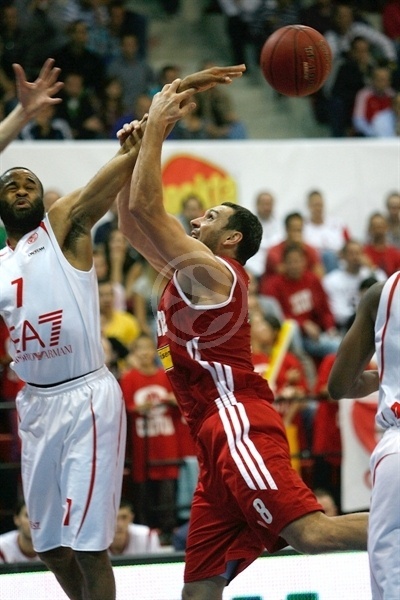 Bourousis scored in the closing seconds to make it 37-40 at the break. Cedevita silenced the Armani attack in the opening minutes of the half as baskets by Babic and Suput put the hosts on top once more. After nearly four scoreless minutes, Malik Hairston ended the drought with his first points of the game. Then the visitors got going as Fotsis dunked on the break and Cook nailed a triple to make it 41-47. After a timeout, the hosts stormed back. Andric scored first and then Gelabale got the crowd going with a slam in transition. Babic brought everyone to their week with a slam that evened things at 49-49. Milan reacted as Bourousis got to the line for 2 and Fotsis buried a triple. 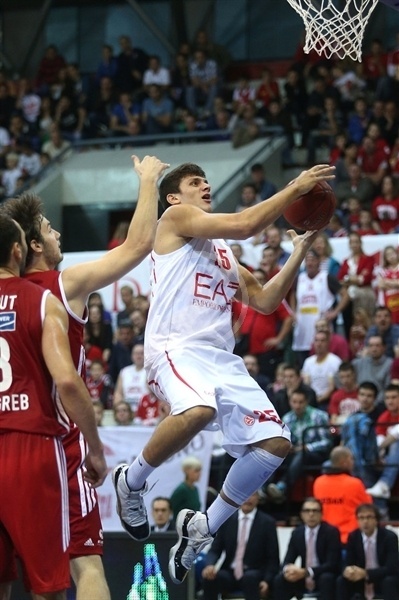 Cedevita hung tough and newcomer Jusuf Nurkic celebrated his debut with a flying bank-shot-plus foul. Richard Hendrix scored at one end, but fouled Nurkic on another basket-plus-foul, which left the scoreboard at 53-56 through three quarters. Armani threatened to pull away as Stipcevic and Basile opened the fourth quarter with back-to-back three-pointers. Following a timeout, Gelabale picked up a missed shot and turned it into 3 points when he scored and drew a foul. Disaster struck for Cedevita when Andric fouled out, but Wright connected from downtown to make it 59-64. Langford and Suput traded baskets, but Langford kept going. He split defenders for a layup and then knocked down a triple as the Milan lead hit double figures, 61-71. With baskets by Suput and Bilan, Cedevita tried to claw its way back, however Milan coasted as Cook threw in his fifth triple and then assisted to Langford and Hairston on the break to make it a 15-point game. The lead continued to swell as Fotsis bettered Gelabale free throws with a triple en route to an important road win for Milan. "We had to attack their players on defense. We did that, but we didn’t do it for 40 minutes. This is the main reason we lost this game. We wanted to play more aggressive on defense. 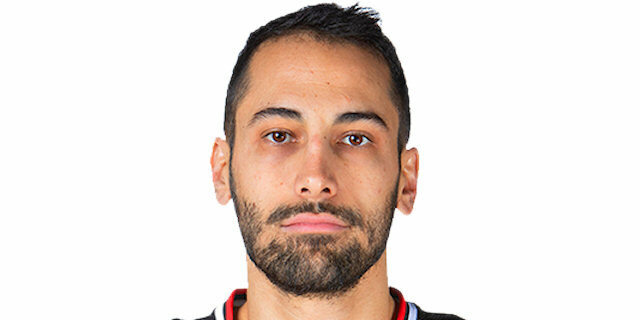 Milano have a lot of good players. They showed their class and they don’t make many mistakes. Milano played real Euroleague basketball today. This game shows us how to play in the future." "This is a good result for us. We won against a tough opponent on the road. Cedevita have a lot of talented players and a great coach. I think that this win will be very important for us at the end of the group phase. We are satisfied. We played good defense, our rebounding was better than in last game and we moved the ball well. My players played unselfishly. We don’t have great three-point shooters. But we have a lot of players that can shoot the ball well if they end up in a good position. 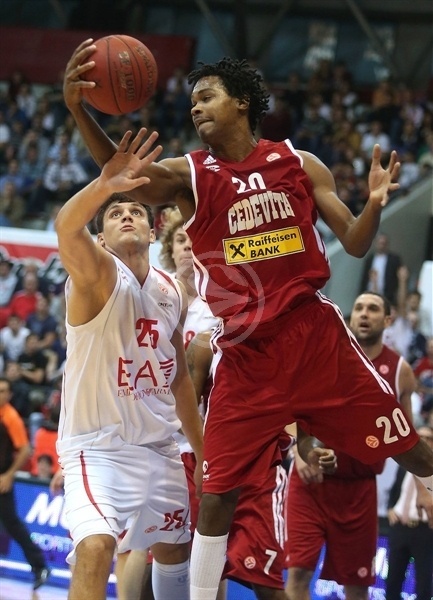 Cedevita were very aggressive and Gelabale played a very good game today." "We played great for 25 minutes. But in last 15 minutes we gave up to many shots. In the future we must play more aggressive. This game showed us how we must grow in the next several weeks because we are not such an experienced team in the Euroleague. The atmosphere was great and I want to say thanks to our fans for their support." "It was nice to come back to Croatia. We played a very good game, but I think we can be even better. In time we will play much better. We have a lot of quality players and I think that we can create problems for every team in the Euroleague."